If you’re a resident of Richmond, VA, you’ll know that our East Coast winters tend to be unpredictable! Fall is right around the corner and before you know it, winter will have arrived and we’ll be falling victim to snow, ice, and sleet. The cold and relentless winter weather can often wreak havoc on our outdoor property and especially fences. It’s important to know how to prepare your fence to survive the chills of winter ahead of time to save you costly repairs when the spring comes back around! It’s important to know how to prepare your fence to survive the chills of winter ahead of time to save you costly repairs when the spring comes back around! Because excess moisture and heavy snow are common during the winter, your wood fencing is prone to the most damage. 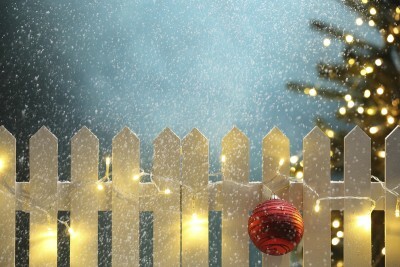 Before the first freeze of winter, you need to ensure that you’ve coated your fence with a waterproof stain or sealant. Believe it or not, this simple step can actually extend your fence’s life by years! Look for a quality brand of sealant that guarantees against mildew, mold, rot, and decay by water penetration. Anything near or leaning against your fence can act as a barrier to trap moisture and lead water to collect – which is the opposite of what you want! Walk along your fence line and remove all debris, including weeds, twigs, leaves, and tall grass to keep your fence from weakening and decaying over the winter. If your fence needs any repairs, it’s essential that you have them taken care of before the chill of winter hits. Gently rock each of your fence posts to test their stability. One heavy wet snow is all it takes to cripple your fence and result in costly repairs for you. Call Hercules Fence of Richmond to take care of any repairs you need before they get worse over the winter! This entry was posted on Friday, August 28th, 2015 at 2:20 pm. Both comments and pings are currently closed.